From left: Abigail Engler, Dennis Staroselsky, Elie Saroufim, and Elizabeth Addison on stage in Lowell. LOWELL — A young addict staggers to the front of the stage and retches. A frightened man, entwined in rope, thrashes on the floor and pleads for help. A woman shudders amid a tortured withdrawal from drugs. 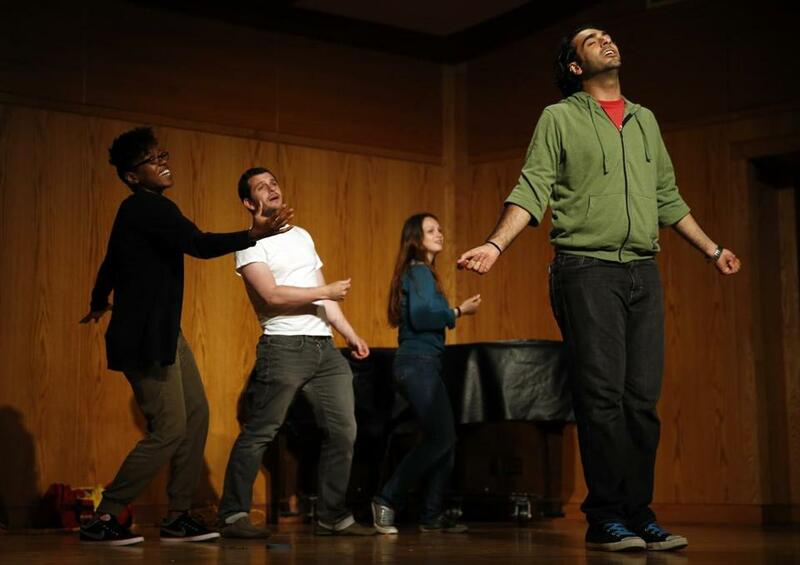 Such is the drama staged by the Improbable Players, a professional troupe that is bringing a raw, riveting message about addiction to schools and stages across a state and region hit hard by the opioid epidemic. It’s a topic the actors know intimately. 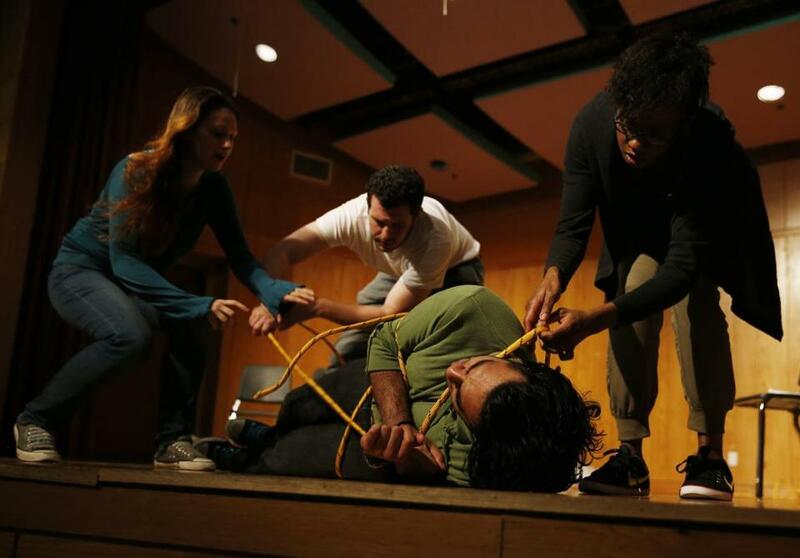 All 11 players in the Watertown-based ensemble are recovering addicts who bring years of painful, personal experience to their dramatization. On this recent night, before 100 parents and children, their efforts also bring peals of loud, sustained applause. It’s an effort — cathartic for the actors and instructive for the audience — that shows the perils of addiction and the difficult pathways to sobriety. It’s not a pretty sight on stage, but it is effective. For much of the performance of “End of the Line,” the troupe’s newest play, the spectators at Butler Middle School were silent, immobile, and rapt in ways that adolescents rarely are. Mass. residents are more worried about drug abuse than are Americans generally, a Boston Globe poll found. “It’s an important message,” said Aidan Shaw, a 13-year-old who arrived early and staked out a front-row seat. Aidan had seen the Improbables the week before and wanted to come again. This time, he brought his stepfather, Daniel Jenkins. “It’s getting worse and worse with each generation,” Jenkins said of drug abuse. The nonprofit troupe has been delivering its message since 1984, when founder Lynn Bratley decided to meld her theatrical skill and personal history to fight substance abuse. What had been a harrowing, alcohol-drenched journey for Bratley became a labor of empathetic love. Previously, Bratley said, “I had been doing all these children’s theater plays, which is really handy if you want to drink at 5 p.m.” The living definition of a closet drinker — “I thought it would enhance my creativity,” she said — Bratley fed her habit from gallon bottles of wine she had stashed behind a door, where the actress hoped her two young daughters would not find them. The troupe’s work uses reality as its muse, building stories from the raw material of an actor’s life or from interviews with other addicts. In addition to their Greater Boston contingent, the Improbables have an eight-actor branch in New York. The collaborative result is a quick-paced production that is part gut check, part pantomime, part lecture, and part helping hand that strives to engage and enlighten. The characters are meant to be recognized from everyday life -- the kid chattering on a cellphone, the cool but menacing guy on the street corner, the ordinary girl in a sleepy, dream-like trance. In “End of the Line,” part of the play is based on the experience of Abigail Engler, an Improbable Player who began abusing drugs in elementary school. Sometimes, the drugs came directly from her mother, who gave them to Abigail to calm her down. Other times, the girl would steal them from her. “Anything I could get my hands on was my drug of choice,” said Engler, a 23-year-old from Somerville who has lost friends to overdoses. “End of the Line” was only Engler’s second performance, but she already has felt its therapeutic value. The performances are good for the audience, she said, and they also are good for her. Temptation still surfaces, but its flashes are brief and resistible. Improbable Players (from left) Elizabeth Addison, Dennis Staroselsky, Abigail Engler, and Elie Saroufim during a recent performance in Lowell. Cast members must have been sober for at least a year when they join the Players. Once in the troupe, some actors divide their time between the Improbables and other theatrical work, an arrangement that helps them make a living and also receive reinforcement from fellow actors in recovery. After progressing from marijuana to alcohol to stronger drugs like ecstasy laced with heroin, Staroselsky said, he hit bottom when a friend died of cancer. Staroselsky’s reaction to the death was to down a bottle of Jim Beam and add pain medication to the mix. “That was the straw that broke the camel’s back,” Staroselsky said. Most actors stay with the Improbables for two to five years and move on to other ventures. But through three decades, Bratley has been the constant who encourages and is encouraged. “I love working with these guys. They’re full of life and ideas,” Bratley said. One of the guys — Elie Saroufim, a 29-year-old from West Roxbury — came to the troupe after seven years of on-again, off-again recovery. Now, Saroufim said, he is having fun with a purpose. Elizabeth Addison, an Improbable Player from the South End of Boston, can relate. “I was one of those kids who would say, I’d never do drugs. Never, never, never!” Addison said. But she did do drugs, she suffered, and now she has been clean for three years. Brian MacQuarrie can be reached at macquarrie@ globe.com.